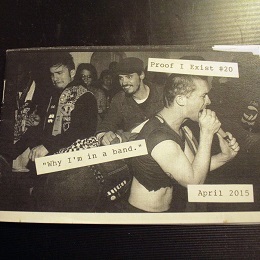 “Proof I Exist #20” is about how Billy got into music and why he continues to play in a band. He loves it. Even though sometimes it can be fleeting, the overall satisfaction is lasting. With sixteen pages, this quarter-sized zine is cut-and-paste, cut-and-dry, text on photocopied background goodness. It was printed on cut-offs from another project, making it a real low-budget printing job. If you would like to order a copy, contact Billy (iknowbilly@gmail.com). It is currently $1 and there are less than fifty copies available. Once it’s gone, it’s all over, baby.